The Bombay Memorial Chest Wood Cremation Urn is made by Howard Miller, a company known for its fine wood craftsmanship. 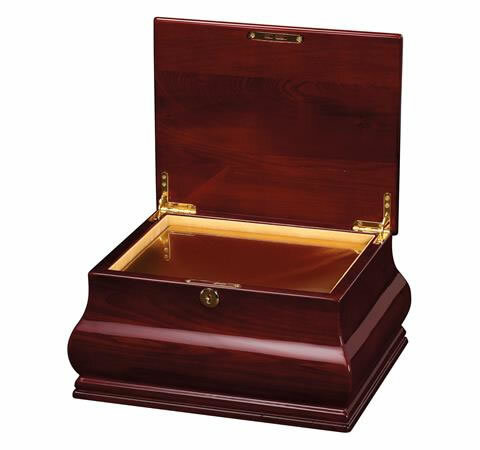 The urn is made of solid Ash or Elm and has elegantly curved sides and a high-gloss finish over a Rosewood stain. The interior is lined with felt and the urn is secured with a brass lock and key. An optional bronze urn insert is available. However, most temporary cremains containers will fit inside the urn. Holds approximately 275 cubic inches without the bronze insert. 12 lbs is the dimensional weight for shipping purposes and is not the actual weight of the urn.